TANGIER, MOROCCO: Yes, there are cyclists. And then there are adventurers who just happen to be cyclists. Meet Christopher Young. He definitely falls into the second category-and with honors. For this 37 year-old Scotsman from a small country village near Loch Lomond (who prefers to call himself a global wonderer, rather than wanderer), there’s no such thing as Mission Impossible. His goal-to bicycle right around the planet. 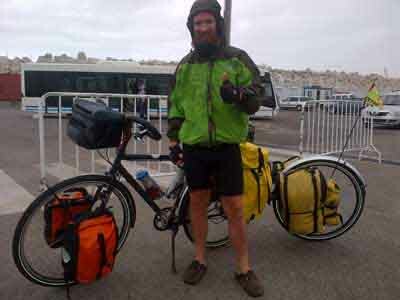 When this writer happened to meet him at the port of Tangier, Morocco (we had both arrived via the same ferry from Genoa, Italy), Chris had already pedaled his way through Holland, Germany, Poland, Lithuania, Belarus, Latvia, Estonia, Ukraine. Moldova, Romania, Bulgaria, Macedonia, Albania, Greece, and Italy (including a side trip to Sicily). I did the math. He’d started his trip on May 14th. Fifteen countries in just four months and twelve days. On a bicycle. Was that possible? Indeed it was, he assured me. How much distance, I asked him, did he cover in an average day? The answer: about a hundred and fifty kilometers (94 miles). Consistently, rain or shine. Then I took a closer look at his bike. That’s when I first noticed the third wheel at the back. (For bags, he explained). It didn’t take long to realize why he needed it. Among the items carried: a tent, sleeping bag, mosquito net, foam mattress, multi-fuel stove, food, Katadyn water filter, first aid kit, air pump, personal clothing, water bottles, sowing kit, rubber patches, wrenches and screwdrivers, and most important- to Chris, at least- an extra pair of Birkenstock sandals. Oh, and an I-Pad and a ukulele- which, he admitted, he was still learning to play. “Keeps the wild dogs away from the tent at night”, he added with a deadpan expression..
“What about maps?” I asked. “Don’t have any. I use an App on my I-Phone called MapswithMe. Saves a lot of space”. A few unknowns to consider here, I thought to myself. Some of those countries were still recovering from brutal civil wars; much of their infrastructures had been decimated, their populations scattered. But then again, he wasn’t some naïve tourist off a cruise ship. He must have done his homework. From Dakar, he went on to explain, he’d try to catch a ship to Brazil, then cycle right around South America before continuing to the USA and Canada. “How long do you think this will all take?” I asked, amazed. He shrugged. “Two years, maybe more. Who knows? Maybe by the time my beard’s grown down to my midriff. A lot depends on how long the money lasts. Anyway, I usually camp and do my own cooking, so I should be OK. I’m a mechanic by profession. I could probably find a few odd jobs somewhere along the way if things got tight. Might even get me a free berth on the odd cargo ship as well “. Evening was approaching, and both Chris and I needed to hit the road if we were to make it to our respective destinations before dark; he, west to Tangier, and I, by motorcycle, east to Tetouan. But I had to ask him one last question. He was pensive for a moment. “Good question” he said.” Actually, It’s something I do ask myself from time to time. So does my family-although they’ve always supported me one hundred percent. Especially my Dad”. He grinned. “As to whether they think I’m crazy or not, that’s another matter”. He paused to adjust one of his brake levers, then continued. “I suppose that I’ve gotten bored with living inside my own comfort zone. As long as you’re in it, you’ll never really discover what’s out there. For me, traveling off the beaten path is a chance to interact with real people, instead of getting depressed by watching those nightly real-life horror stories on BBC or CNN. The fact is, ninety-nine percent of folks I meet, especially those in rural areas who live mostly off the land, couldn’t be nicer. I can’t even begin to tell you about how many times they’ve offered me a free meal or a bed for the night, or some other act of kindness, even when they had hardly enough for themselves. It just makes me want to believe- contrary to what the media keeps telling us- that the world isn’t really such a bad place after all.” He shrugged “I suppose that some people would compare me to an ostrich with its head partially in the sand. But you know what? I like the view”. I thought that he had answered my question with rare honesty and amazing simplicity. At the same time, I realized that I may have learned something about myself as well. Somehow, it all seemed to make sense. Or would, eventually. We shook hands and promised to try to stay in touch. One nomad with another.